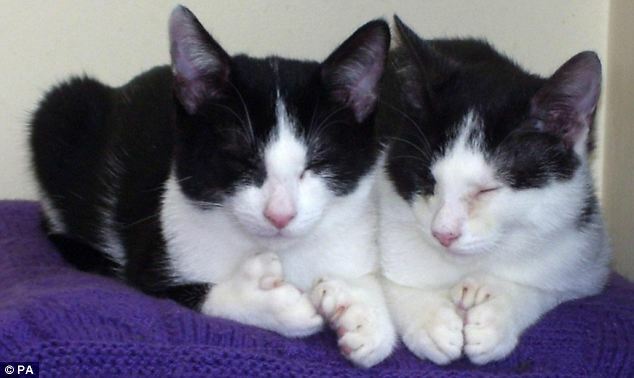 Cats Fred and Ned are no ordinary cats – they are polydactyl cats. While most cats have 18 toes, Fred has an extra 10 digits and Ned has eight. The four-month-old kittens are currently being looked after by Cats Protection in Gosport, Hampshire. Branch volunteer Kate Stapleford said: ‘These two kittens were in poor condition when they arrived but with veterinary attention and a lot of TLC from their fosterer, Fred and Ned are now thriving. Ms Stapleford added: ‘Fred and Ned are special in that as well as extra toes on the front paws, Fred has extra toes on his back paws. Most cats have four toes on each back paw and five toes on each front paw. ‘Although they look a little unusual and odd, the extra toes do not affect their health in any way.